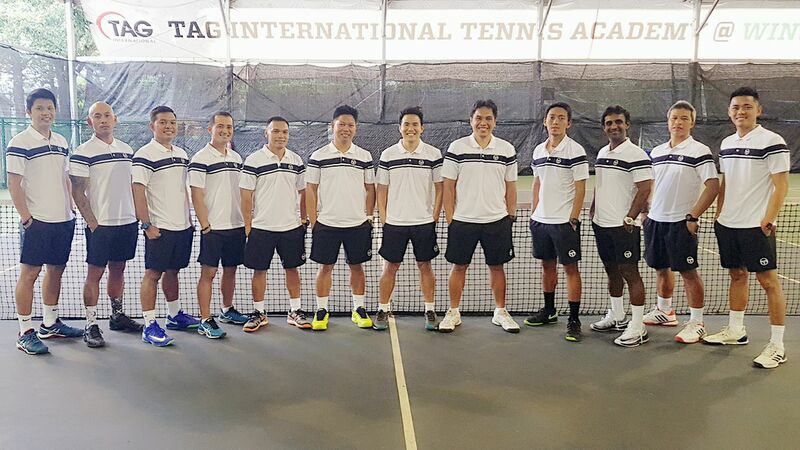 Private lessons are the platinum standard of TAG International’s tennis lessons. Meticulously planned in discussion with you, the client, each lesson is specifically tailored to your exact needs. Technical drill sessions to improve a weakness into a strength, tactical live ball sessions to appreciate the nuances of winning match play strategies, or just a hit about after work after the end of the day in the office, TAG’s private lessons offers you the client unparalleled development potential, at the privacy of your own session, at a time of your choosing. – $100/h at Winchester Tennis Arena inclusive of indoor court hire. – +$10 per every additional person per hour. (c) 42 hours + 8 hours complimentary. Ladies who are part of teams competiting WITS or LTS League or STA Inter-Club Competitions may form a training squad and be coached by TAG International’s expert coaches. Techncial skills needed for competitive doubles is the focus here, and synergistically combined with repeated practices of doubles scenarios such that on matchplay, you are well prepared for all that the opponents have to throw at you, and you reply with interest. One of TAG International’s most popular group programs. – $30 per adult per hour, minimum 4 participants, maximum 6 participants, usually sessions are for 2 hours. Inclusive of court hire fees. – 2 coaches on 2 courts or 3 coaches on 3 courts for large teams may be arranged. Numerous companies have a recreation club that encourages staff to engage in sporting activities together to foster camaraderie among colleagues and to learn new skills together. The basics of the game are imparted during these clinics and participants will be able to hit the six basic shots of the game – forehand, backhand, forehand volleys, backhand volleys, serve and overhead – after the clinic. – Usually 8 to 12 sessions, once a week. Our novice program is most suitable for players who are keen to pick up the sport and have absolutely no prior experience with tennis at all. Players will learn the basics of tennis, including the grip, forehands, backhands, volleys and serves. – Rates between $27.50 ~ $35.00 per hour depending on location. Lessons are 1.5 hours. Beginner program will equip the introductory player with all the necessary basic skills to help the player to get on court and start playing tennis. Forehands, backhands, serves, volleys and more will be covered during this program. Players will also learn the rules of the game, scoring as well as court areas and lines. Intermediate program will cater to players with previous playing experience and who are looking to take their game to a higher level. All ground strokes will be covered while incorporating factors such as directional and tactical hitting. Volleying, overheads and directional serving will also be covered. Physical aspects of the game will also be addressed so expect the program to be more movement orientated with moderate physical intensity. The Pee Wee program caters for the youngest of all tennis players and focuses on fun and games so children can associate tennis with enjoyment. The program involves eye-hand coordination games, moving and running games, and most of all, fun and play for the duration of the class. It is a good lead-in class prior to the children moving on to the Grippers program, where the children can then start learning the basics of the tennis game, for instance, forehands, backhands, volleys and serves. – Rates between $27.50 ~ $35.00 per hour depending on location. The Grippers is where it all begins. Children will learn the basics of the tennis game while having loads of fun enjoying their time on court. Forehands, backhands, volleys and serves are all the basic strokes which Grippers will master. Mini tennis and plenty of tennis based games will ensure that the children will want to keep coming back for more. Hitters will take the children’s tennis to the next level. Children with some playing experience will fit well here. All strokes of tennis will be covered with the drills becoming more movement orientated and the games leading towards more tennis point play. This is where the children begin to get into the real game. As the name suggest, the Players program is where real game play begins. Children with a good knowledge of the game will look to this program for a more serious playing environment. Some aspects of the program include directional hitting, smashes, serving, point play and physical fitness. – Rates between $27.50 ~ $35.00 per hour depending on location. Lessons are 2 hours.